IP67 and IP69K certified robots, will perform palletising and food packing assembly tasks. 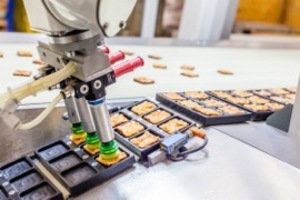 Delta and articulated arm robots will show high levels of dexterity when handling unpackaged and packaged foods at speeds of up to 180 picks per minute. As well as the robot arms, attendees will see a variety of end-effector tools including vacuum and gripper style which will effectively pick and place the most delicate of products. Robots in action include a cell combining two robots, an M3 delta style system and a M430 articulated arm robot, which will pick biscuits and place them into blister packs. Following on from this an articulated arm LR Mate 200iD will pack the blister packs into retail trays. To represent packing further down the production line, two palletising robots, a FANUC M710iC/50 and an M410-iC/185, will demonstrate palletising of both trays and bulk bags.